ok!choir - ok was never better! It’s time for us to say “Hello” to Adele from the choir side! At this month’s ok!choir Pop Up night we’ll get to have it all, as we learn “Rolling In the Deep” from one of modern pop’s favourite ladies, Adele. We’re very happy to be returning to cosy and friendly Lovelite bar in Friedrichshain this month. If you’re wondering if “someone like you” should come along, the answer is definitely yes. Ok!choir Pop Up nights are open rehearsals that anyone can join in on. We’ll be learning the whole song in 3 part harmonies, and will finish the night with a tiny performance in the street, in a park, or at a train station. Regardless of whether you’re a superstar singer like Adele or more of a shower-only performer, this night is for you. Gimme gimme gimme another ok!choir Pop Up night! 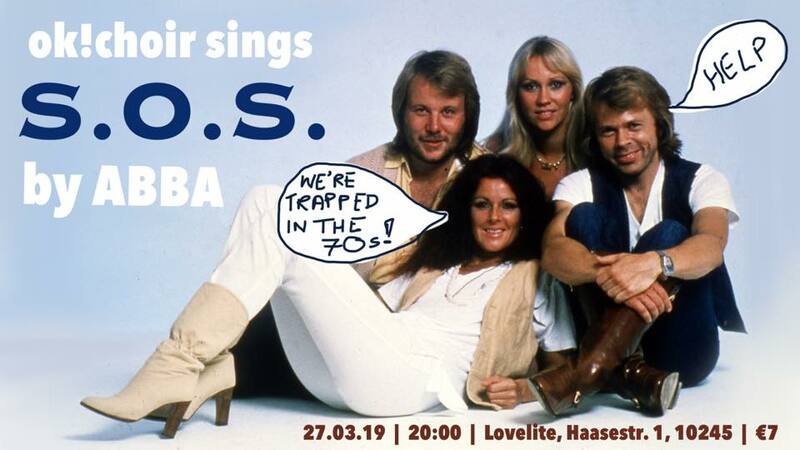 For March’s monthly open rehearsal, ok!choir will take you to the land of IKEA with Sweden’s second-favourite all-caps export, ABBA! You won’t need to call S.O.S. because ok!choir’s Pop Up nights are open for anyone to attend, no experience necessary. There will be something in the air on the night of 27th March, when we’ll learn the whole of “S.O.S.” in 3 part harmonies and end the evening with a tiny performance. You’ll be having the time of your life (🎶ooooh🎶) when you join us at Lovelite in Friedrichshain to see that girl, watch that scene and dig it with all the other singing and dancing choirling queens. Without a song or a dance what are we? Don’t find out. Come to Pop Up! 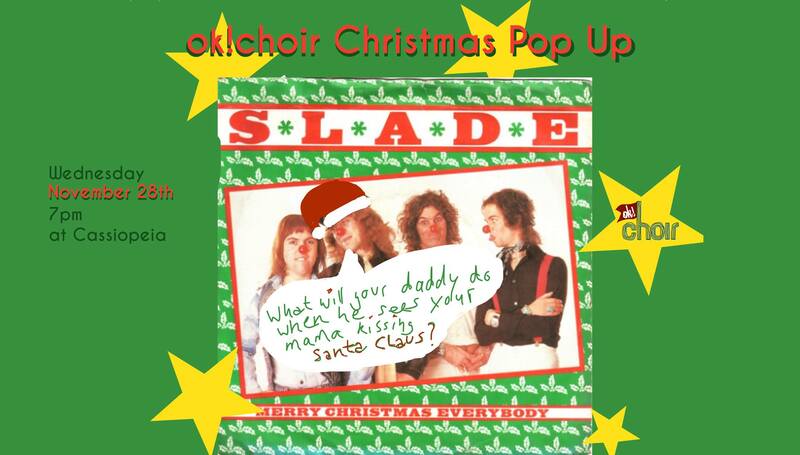 You told us what you want, what you really REALLY want, and it turned out to be ... ok!choir Pop Up night! We are back from the holiday break and ready to get back into our last-week-of-the-month open sessions. 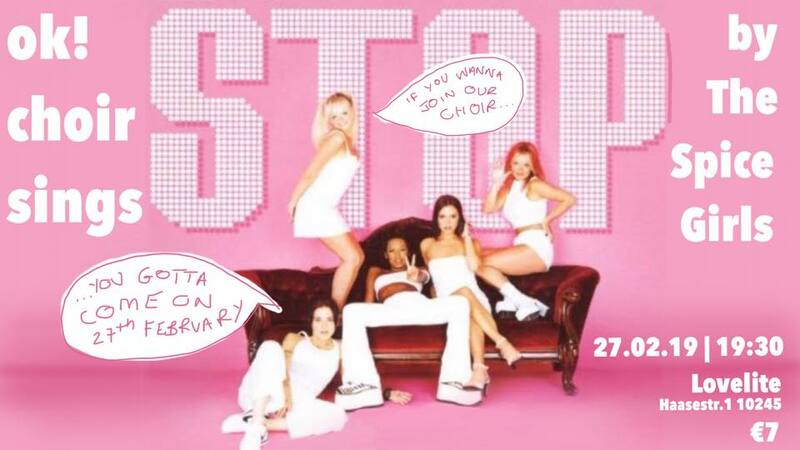 If you wannabe in our choir, you gotta join us on 27th February at Lovelite in Friedrichshain. If you’re nervous about coming along, you can stop right now thank you very much! Pop Up nights are open for anyone to attend, regardless of singing experience. We’ll learn to sing The Spice Girls’ funtastic hit “Stop” in 3 part harmonies, and finish the night with a tiny, casual performance somewhere near the venue. 27th February is the night when approx. 70 singers become 1. Hai! Si! Ja! Hold tight! There will be some Christmassy warm feelings, but most of all there will be so much fun on stage as we sing our repertoire of beautifully arranged pop, rock and indie songs. There might even be a proper Christmas hit, and a few surprise guest performances. Everybody will be having fun. SO much fun! 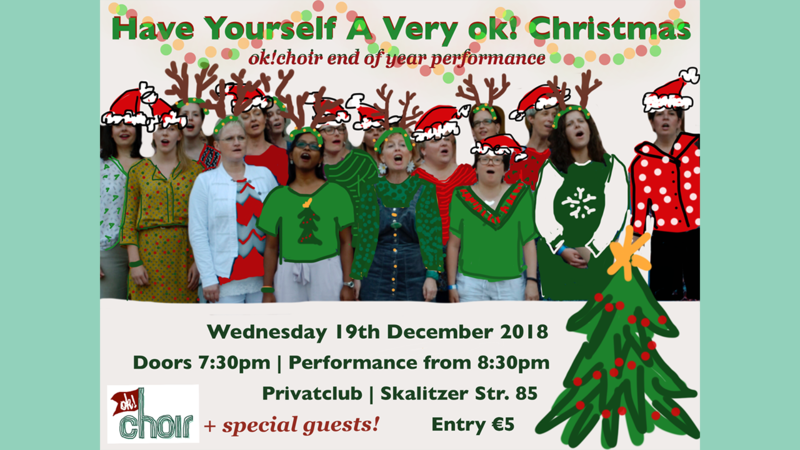 It will be the last ok!choir Pop Up Night of the year and it will also be the warmest, coziest and most Christmassy one ever. Our grannies always told us that the old songs are the best. So we picked a very special 1985 classic that will warm our hearts as we sing it together in three parts. Join us as we come together to sing Slade’s “Merry Christmas Everybody”. No special requirements, no experience necessary, just bring your stockings, red noses and/or sleighs and let’s have a real beautiful Xmas Pop Up. Normally ok!choir will be the first to tell you, there’s nothing scary about singing (especially with a big group of lovely friends!) BUT for this month’s very special Halloween Pop Up, we’re making an exception. 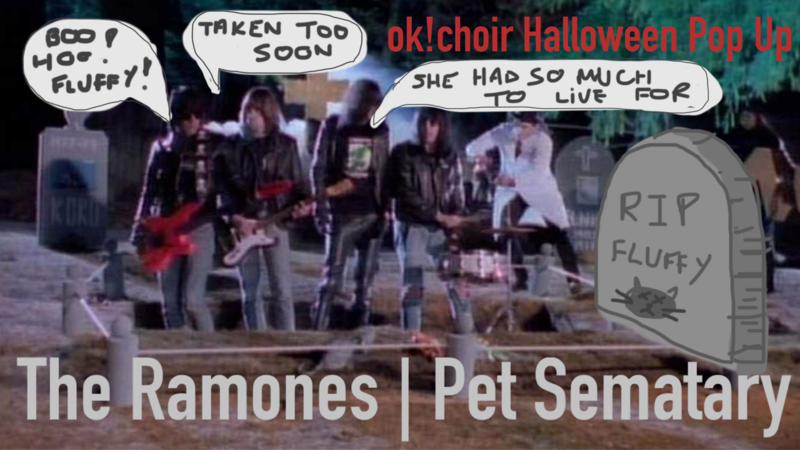 Join us at Cassiopeia in RAW Gelände to sing The Ramones’ very spooky “Pet Sematary”! This song was written to accompany the movie adaptation of Stephen King’s very famous horror novel of the same name. The song has a pretty upbeat vibe, but don’t be fooled! The lyrics feature death, cold winds, bones, tombstones, fangs, rotting flesh, wolves and dancing skeletons. Woooooooooh SCARY! Come along in your favourite Halloween costume and get ready for a spooky, scary, creepy sing along! Hey hey. It’s time for another Pop Up night, this time with a song that never gets old. Just like our man Neil here. Isn‘t he still the same old guitar hero hippie master that he was 40 years ago? My my. This Pop Up will be a real emotional ride. Let’s all get in touch with our inner emo rock n roll teenager and learn “Hey Hey, My My” in 3 parts. Or maybe more than 3 parts?! The possibilities are endless with a classic like this. Join ok!choir and friends at Birgit & Bier in Kreuzberg for this month’s Pop Up retro adventure. No experience necessary, just come along and enjoy some choiry happiness in the end-of-summer open air! You probably thought Beyonce's songs could not get any better, right? Just wait until you can sing "Crazy In Love" in 3 part harmonies with a choir of your new best friends! It will be a new high point in your Beyonce love affair. All Beyonce fans (i.e. everyone who has ever heard of Beyonce, i.e. everyone) are welcome to join ok!choir for this special open Pop Up rehearsal in the open air at wonderful Birgit & Bier in Kreuzberg. No special requirements, no experience necessary. Just bring along your best crazy Beyonce love. It's the time of year when we're all dreaming of summer holidays ... relaxing on a sun-kissed beach, swimming in a clear blue ocean, tropical drinks, warm nights under the stars. Sounds good right? 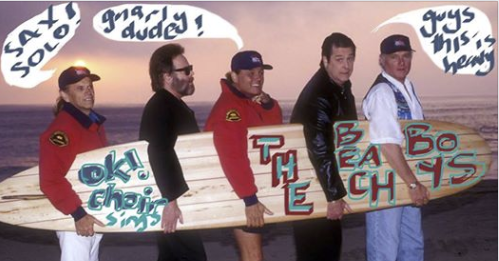 Join ok!choir and friends for an auditory summer holiday on 25th July, when we'll let the legendary Beach Boys take us to a little place called "Kokomo". Regardless of whether you respond to a diminutive like "baby" or "pretty mama", anyone is invited on our imaginary tour of Aruba, Jamaica, Bermuda and Bahama. Please come dressed in your loudest Hawaiian shirt or other fun beach wear, as we learn Kokomo in 3 part harmonies out in the open air at Birgit & Bier in Kreuzberg. It's official: summer is here, the dog days are indeed over. The time for singing is upon us! Get ready to clap your hands with ok!choir as we learn Florence and the Machine's feel good hit, "The Dog Days Are Over", in 3 part harmony. It is impossible not to dance along to this song! No, really, try it! We challenge you to listen to this song without at least tapping your feet or bobbing your head a little bit. It can't be done. It's infectiously elating. 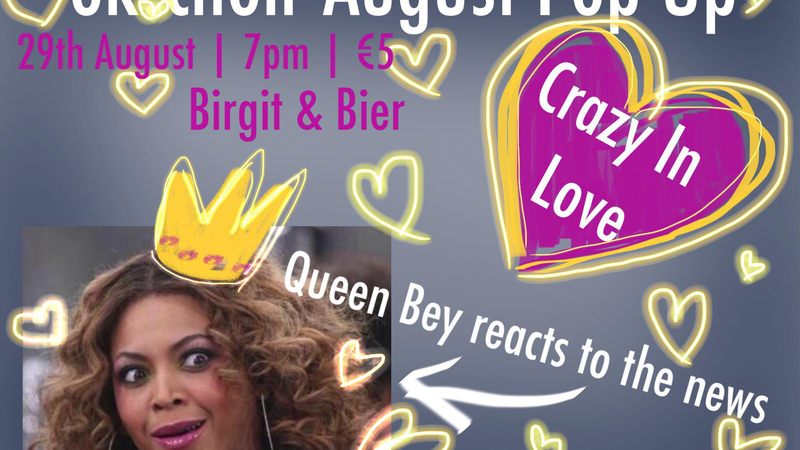 ok!choir is overjoyed to be holding this month's Pop Up rehearsal in the open air at Birgit & Bier. Anyone is welcome to join in ok!choir's monthly Pop Up events - no experience necessary, just come sing your heart out with 70 or so of your new best friends! 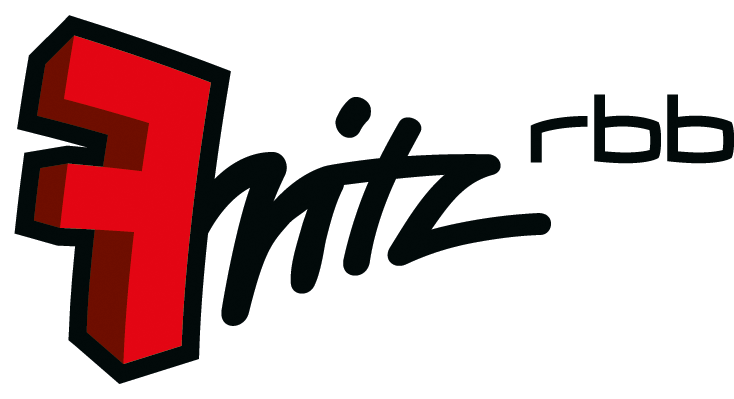 ok!choir joins forces with their sister-choir, The Dienstag Choir, to sing on Radio Fritz in support of Fête de la Musique’s European Singalong. For the Singalong, groups all over the city and all over Europe will come together at 19:00 in a big, decentralized performance of the same three songs, to celebrate music’s ability to unite communities across boundaries and borders. ok!choir and The Dienstag Choir are excited to perform one of Oasis’s best loved hits “Don’t Look Back in Anger” just prior to the main Singalong, at around 18:30. Tune in to 102,6 UKW or follow the livestream link below to hear us! 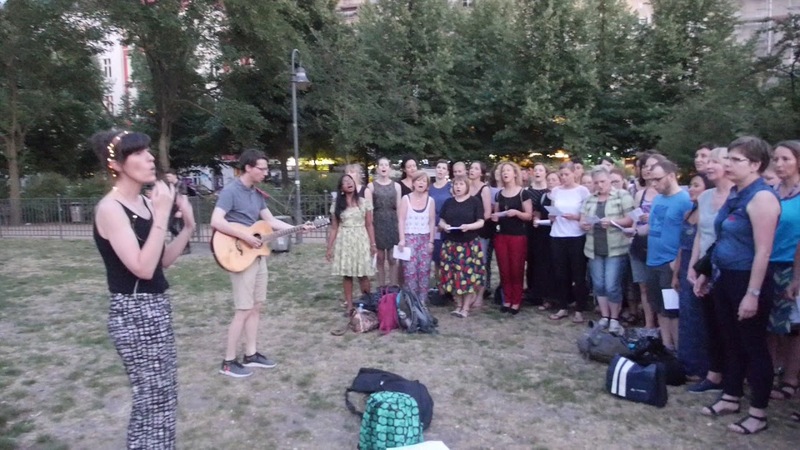 If that whets your appetite for singing, you can head along to Lustgarten in Mitte to participate in the central Singalong event at 19:00. Anyone and everyone is invited to join in the Singalong - no experience necessary! ok!choir’s debut set at Fête de la Musique! 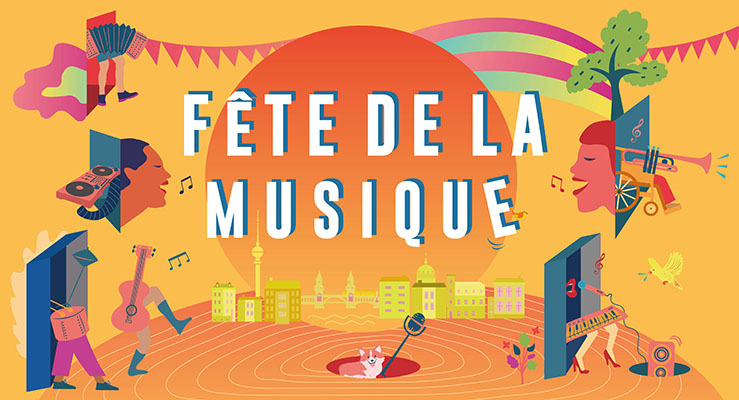 This year’s Fête de la Musique opens with a micro-festival, a one-night-only taster of the diverse musical acts that cohabit in Berlin, which will include the premiere performance of ok!choir’s current repertoire! We feel very privileged to participate in this special event. Join us from 18:00 to watch some of the other amazing performances, and check out the choir’s set at the main entry of the Theater from 19:45pm. 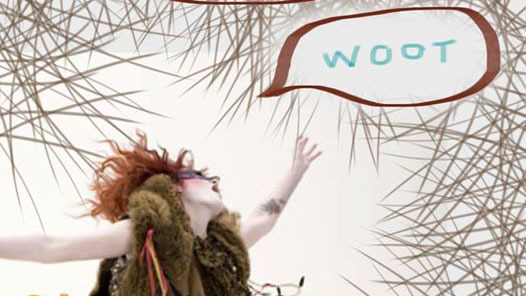 ok!choir is a mixed voice pop choir of 45 singers based in Friedrichshain, Berlin. This weekly edition of the choir sings in four or five part harmonies, and regularly updates our repertoire of pop, rock and indie tunes. A few favourite from our current setlist include “Free Fallin’” by Tom Petty and the Heartbreakers, “Buzzcut Season” by Lorde, “Wonderful Life” by Colin Vearncombe and “Take Me With U” by Prince. We also hold an open Pop Up rehearsal on the last Wednesday of each month, which anyone can attend. Come along! ok!choir is conducted by musician, researcher and choral director Claire Coleman, and is run by a small group of delightful volunteers: Gina Buchwald, Vladislav Nachev, Florian Nims, Jon Pennant-Williams, Wolfgang Schuler and Irene Wienke. Our website was made just for us by the inimitable Christopher Rieke. Our weekly edition has relatively stable membership. There aren’t many opportunities for new members to join. Subscribe to our mailing list to hear when vacancies arise. But there are our open Pop Up Nights! ok!choir Pop Up nights are open rehearsals that happen on the last Wednesday of each month. Anyone can drop in and attend. Come and join us! Which edition of the ok!choir are you interested in? ok!choir’s monthly Pop Up nights are open for anyone to drop in and attend – no prior registration or preparation is required, just come along! At Pop Up nights the choir in attendance learns a whole song from beginning to end by ear, which means without sheet music. It is perfect for beginner singers to come and try being in a choir, or for experienced singers to have a fun, commitment-free, social sing with friends. Each Pop Up night concludes with a low-key performance, which might sometimes be as simple as making a video of ourselves, or might involve a sneaky surprise performance at a U-bahn station, in a bar, or in the street. Check out our Newspage for details of when and where you can join us next! 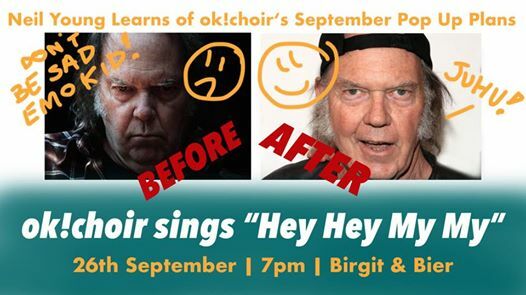 ok!choir’s 45 regular members meet weekly and sing a range of pop, rock and indie songs in four or five part harmonies. The choir formed in 2018 to give members of the Berlin Pop Choir and the Berlin Pop Ensemble a place where they could continue to sing together after the sad and untimely death of conductor Lyndsey Cockwell. Lyndsey instilled in her choirs such a great love of singing, and of the particular community she had built for them to sing in, that many members of the choirs felt that the best way to honour Lyndsey’s memory was to continue to sing together, as she had taught them to do. You can read more about Lyndsey here, learn about her choirs here and here. ok!choir continues to practice many of the principles of good choiring that Lyndsey taught. We take music seriously, but ourselves less so. We aim for excellence in singing technique, but not at the expense of a good time. We believe that singing is something anyone can do with a bit of practice, and that making music shouldn’t be restricted to only those with special musical gifts and talents. We love popular music of many styles, and it brings us joy to get to know songs by some of our favourite bands and musicians on a deeper level. We want to share with our audiences the euphoria we feel when we sing together. ok!choir is a mixed voice pop choir of 45 singers, based in Berlin. 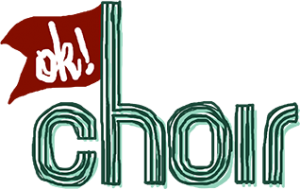 Where and when does ok!choir rehearse? ok!choir rehearses in Friedrichshain most Wednesday evenings. How can I join ok!choir? The Good News: there are no prerequisites for joining ok!choir. ok!choir is unauditioned, and there is no expectation that members can read music. We do expect our members to attend most rehearsals and to practice their parts at home. 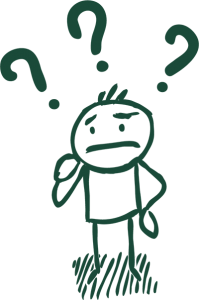 The Bad News: ok!choir has relatively stable membership, so there aren’t many opportunities for new members to join. Subscribe to our mailing list to hear when vacancies arise, and stay up to date with other choir news. But don’t despair! ok!choir holds a monthly Pop Up rehearsal on the last Wednesday of each month, which is open for anyone to attend and participate in! Check out our News page for details of the next Pop Up night, or subscribe to our newsletter to have the info emailed to you monthly. What is the ok!choir Pop Up night, and how can I participate? ok!choir Pop Up nights happen on the last Wednesday of each month, and are open for anyone to drop in and attend. You don’t have to sign up or do any kind of preparation, just come along! On Pop Up nights the choir in attendance learns a whole song from beginning to end by ear, which means without sheet music. It is perfect for beginner singers to come and try being in a choir, or for experienced singers to have a fun, commitment-free, social sing with friends. Each Pop Up night concludes with a low-key performance, which might sometimes be as simple as making a video of ourselves, or might involve a sneaky surprise performance at a U-bahn station, in a bar, or in the street. Visit our news section to see when and where the next Pop Up is happening. Can I book ok!choir to perform at my venue or event? Yes! We love to sing for others. Contact us for more info. I want to see ok!choir in action! How can I do that? Visit our news section for information about upcoming gigs. You have a question? Don't hesitate to send us a message. You would like to receive the latest news? Subscribe to our mailing list. ok!choir will use the information you provide on this form to be in touch with you and to provide updates. You can change your mind at any time by clicking the unsubscribe link in the footer of any email you receive from us, or by contacting us at info@okchoir.com. We will treat your information with respect. For more information about our privacy practices please visit our website. By clicking below, you agree that we may process your information in accordance with these terms.